Reach for Facebook Pages continues to decline, hitting 2.6% on average, and a very low 2.6% for Facebook Pages with more than 1 million fans, according to Locowise. In their March analysis, Locowise gathered reach, engagement and like growth from a sample of 5,000 pages. 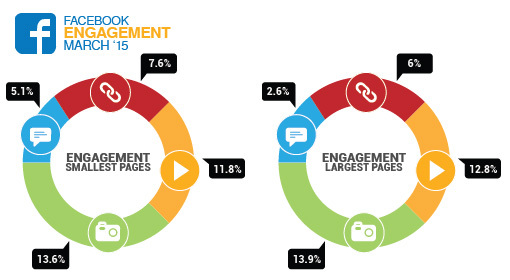 As usual, smaller pages tend to have higher percentages of reach and engagement, as their Fans are more homogeneous. So, what are the takeaways from this? Use Facebook Ads to promote your content to the right audiences to get more reach. Have you seen a drop again in March in your Facebook Page's organic reach?